“Hopefully, we hit a few buttons that can give ourselves some life here and some momentum that we can carry this forward,” Anaheim coach Randy Carlyle said of the win. Gibbons scored less than four minutes later, tipping a shot from the point from defenseman Andy Welinkski and ending Stalock’s night. 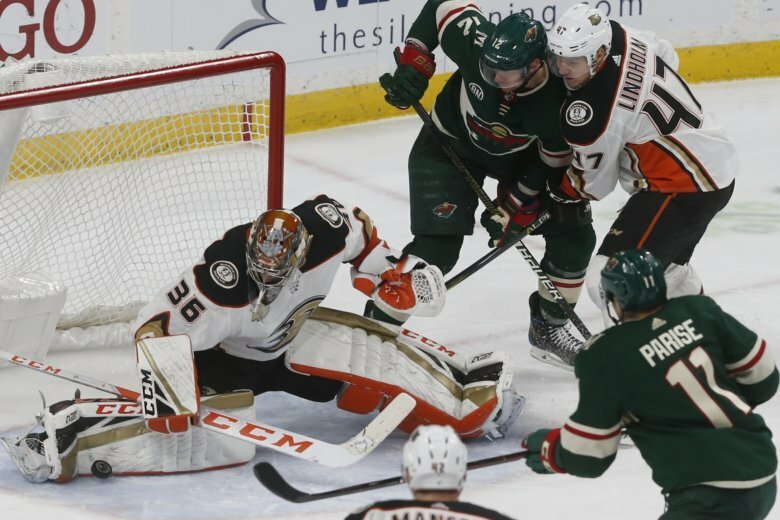 Dubnyk, the Wild’s All-Star representative, had started 16 of 17 games before Stalock led Minnesota to a win against Los Angeles on Tuesday with 31 saves. Boudreau said Dubnyk was feeling tired and tried to give his top netminder another night off Thursday. NOTES: Del Zotto and Kloos were scratched for Anaheim. Del Zotto, acquired from Vancouver, isn’t expected to join the team until the current road trip ends on Sunday. … Anaheim F Max Jones made his NHL debut after being recalled a day earlier when Jakob Silfverberg and Ryan Kesler were placed on injured reserve with lower-body injuries. … Both teams were 0 for 4 on the power play and Minnesota has now killed off two of the past 21 opponent power plays. … Thursday represented the first time Stalock has started two straight games since a career-best seven in a row from Dec. 14-27, 2017. … Parise had a career-high 11 shots on goal.